CONGRATULATION to Seth Sanders, recipient of the Frank Moore Cross Award. HARTFORD, Conn. – Back in the late 1980s, Seth L. Sanders studied at Harvard College under one of the most eminent Biblical scholars of the 20th century, Frank Moore Cross Jr. Thus, it’s only fitting that Sanders, assistant professor of religion at Trinity, was recently awarded the 2010 Frank Moore Cross Award for Sanders’s 2009 volume, The Invention of Hebrew, which argues that Hebrew was the first successful vernacular literature. The award, named in honor of Cross, now professor emeritus at the Harvard Divinity School, is presented annually by the American Schools of Oriental Research (ASOR), based at Boston University. The Invention of Hebrew, published by the University of Illinois Press, was also a finalist in the scholarship category of the 2009 National Jewish Book Awards. Sanders, a member of Trinity’s faculty since 2007, received his B.A. from Harvard and his Ph.D. from Johns Hopkins University. He is also the editor of the Journal of Ancient Near Eastern Religions. On sabbatical this year, Sanders is working on a second book, Divine Personae and Journeys to Heaven: Ancient Near Eastern Elements of Early Jewish Mysticism and Apocalypticism. On entering Harvard, Sanders thought he was going to be an artist. But he found that religion and mythology fascinated him. In particular, he became interested in connecting social theory with ancient myth and inscriptions. Eventually, that led to his research and subsequent book. “I thought there might be something about the form in which the Bible is written that might explain the power of its content,” he said. Although The Invention of Hebrew is primarily intended for academic use, Sanders said that he wrote the book in a way that lay people could understand and appreciate, as well as those interested in Jewish studies, anthropology and political thought. ASOR’s U.S.-based coordination center, its publications program and its three affiliated overseas centers in the Middle East have been in the forefront of America research efforts for more than a century. Among ASOR’s distinguished alumni are many of the world’s major Near Eastern and Biblical scholars. ASOR disseminates news of the latest research findings in its publications and through lectures at its annual meeting, which brings together scholars from around the world. The Frank Moore Cross Award is one of seven honors that ASOR bestows each year. Seth also has a blog called Serving the Word. THE STEINSALTZ TALMUD is praised by Mordechai Beck at the Guardian blog. The discovery of the Magdala synagogue occurred after the center, a Christian guesthouse in Jerusalem operated by the Legionaries of Christ, decided to build a hotel and visitor center near the Sea of Galilee. They chose to build in Magdala, said to be the home of Mary Magdalene, about 100 miles north of Jerusalem. Before the complex could be built, however, the government required that there be an archaeological investigation on the site. The dig, directed by Dina Avshalom-Gorni and Arfan Najar of the Israel Antiquities Authority, began in July 2009. One month later, workers uncovered the first remains of the synagogue. Archaeologists have since unearthed pottery, coins and frescoes that have retained their vivid colors through the centuries. Magdala was one of several Galilean towns where Christians often shared the synagogues with Jews. The synagogue may have been destroyed during a Jewish revolt against Roman rule between 66 A.D. and 70 A.D. Since the discovery, the Israel Antiquities Authority has given the Notre Dame of Jerusalem Center permission to build the hotel and visitor center, with a projected opening date of July 2012. New construction plans add an ecumenical chapel on the spot where the ancient synagogue was found. That last comment is wild speculation, but it's nice to have the background to the discovery anyway. A stone engraved with a seven-branched menorah was also found in the building. CAN'T MAKE IT UP: Full-Scale Replica Of Noah's Ark Planned for outside Cincinnati. Hmmm ... do they know something we don't? Somewhat related Noah's Ark stories are noted here, here, here, and here, but none as ambitious as this one. A Palestinian Authority “study” that rejects Jews’ claim to the Western Wall disappeared on Wednesday from the official website of the Palestinian Ministry of Information. However, a senior PA official in Ramallah revealed that the controversial report was cut at the request of the United States. Despite the claim about a hacker attack, the ministry’s website did not seem to be affected at all and was continuing to publish new material all day. The paper about the Western Wall, which was first reported by The Jerusalem Post on November 22, had appeared on the site until Tuesday night. It was removed the first time almost immediately after the US criticized the Palestinians for issuing it. The Prime Minister’s Office responded to the PA’s decision to take down its “study” denying any Jewish connection to the Western Wall off the website, by saying it was notenough for the PA to pretend this never happened, but was important that the leadership denounce it publicly. Three books on the Achaemenid Empire, all aiming at the general audience. One of them is just bad, the second one is unnecessary, the third explains what everybody already knows. This is the wrong way to introduce people to one of the most fertile branches of ancient history. The reviews also contain a wealth of internal links to pages relevant to ancient Iran at the Livius site. UPDATE: I just noticed that these reviews are two-and-a-half years old. But I only noticed them today and they are of undiminished interest. JERUSALEM.- The Israel Museum, Jerusalem, will present one of the most important private collections of illuminated Hebrew manuscripts and printed books in the exhibition A Journey through Jewish Worlds: Highlights from the Braginsky Collection of Hebrew Manuscripts and Printed Books, on view from December 1, 2010, through April 30, 2011. The exhibition marks the first opportunity for Israeli audiences to experience examples from the notable library of Swiss collector René Braginsky, which includes objects ranging from a 6th-7th century Shema Yisrael (Hear O Israel) amulet to a rare early 20th century Samaritan Ketubbah (marriage contract) from Schechem. The collection comes to Israel following an international tour, which included Amsterdam and New York. Its presentation at the Israel Museum will be complemented by related objects from the Museum’s own Jewish Art and Life holdings, providing insight into a vibrant and artistic Jewish culture around the world. • A Shema Yisrael traveler's amulet, dating from the 6th – 7th century CE, inscribed with an early and unusual combination of biblical verses. 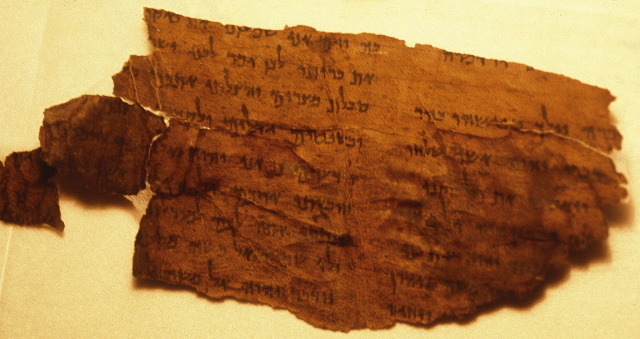 It is presented alongside two singularly important items from the Israel Museum collection: a passage from the book of Isaiah from the Dead Sea Scrolls, which dates to the first century BCE and is among the oldest known Biblical texts; and a page from the Aleppo Codex, the earliest known Biblical Hebrew manuscript, from the Middle Ages. The amulet offers important rare testimony to the existence of Hebrew Biblical text during the “silent” period between the time of the Dead Sea Scrolls and the oldest surviving Medieval manuscripts. GOOD FOR THEM: The Obama Administration has condemned the latest bout of PA Jewish-Temple denial. PJ Crowley says paper "factually incorrect, insensitive and highly provocative"; tells PA leadership to combat de-legitimation of Israel. WASHINGTON -- The Obama administration condemned on Tuesday a Palestinian Authority-backed paper that denies any Jewish connection to the Western Wall. “Regarding a claim by a senior Palestinian Authority official that the Western Wall is an Islamic Waqf, we strongly condemn these comments and fully reject them as factually incorrect, insensitive and highly provocative," State Department spokesman PJ Crowley said Tuesday. "We have repeatedly raised with the Palestinian Authority leadership the need to consistently combat all forms of de-legitimization of Israel, including denying historic Jewish connections to the land." Multiple Jewish groups and members of Congress have slammed the Palestinian Authority for the paper, which appeared on its website last week signed by a senior Ministry of Information official. Background here and keep following the many links back in many posts for extensive discussion of the problem of PA and Palestinian (etc.) denial of basic historical facts related to the Jewish historical association with Jerusalem, the Temple Mount, etc. UPDATE (2 December): The report has now been removed from the PA website. HAPPY HANUKKAH to all those celebrating! The festival begins this evening at sundown. BIBLICAL STUDIES CARNIVAL 57 has been published by Deane Galbraith at the Religion Bulletin blog. This carnival sets a new standard. Mark Goodacre asks Possibly the best Biblical Studies Carnival Ever? and the answer is surely yes. It includes detailed coverage of the recent SBL meeting in Atlanta, with special attention to the Biblioblogging session, and very, very full coverage of all the usual categories and more. There's even a humor and gossip section that notes, for example, Helen Ingram's recent ascension to rock-stardom. And there's a new, quality-based ranking of the top 30 biblioblogs, in which PaleoJudaica does very well. The Greek word for "blog"
SO NOW I KNOW the Greek word for "blog." Cool. UPDATE (1 December): James McGrath is really getting into this. RECENT DEVELOPMENTS in the Raphael Golb Dead-Sea-Scrolls identity-theft and sock-puppetry case receive attention at Robert Cargill's blog: trying to dig oneself out of a hole: raphael golb posts his appeal online. Deborah Ugoretz, Miriam Stern and Debbie Schore of Teaneck will have their artwork featured in the Dura Europos Project at the Philadelphia Museum of Jewish Art from Dec. 5 to March 27. The women's artwork reflect murals found in the 3rd century synagogue of Dura Europas in Syria. These ancient murals, which were created by artists within a diverse religious environment, are displayed in the National Museum in Damascus, Syria. The Jewish Art Salon of New York City is organizing the exhibit, with the opening planned from 4 to 6 p.m. Dec. 5. Follow the Jewish Art Salon link for a flier on the project. There's more on Dura Europos and its murals here and follow the links, and note especially here. Teaneck (New Jersey) also has an interesting association with the Dead Sea Scrolls. The recent Palestinian Authority report stating that the Western Wall has no religious or historical significance to the Jewish people is sadly yet another attempt at political historical revisionism. Under normal circumstances, we could dismiss this as a pathetic and infantile attempt to erase the history and peoplehood of another people. Unfortunately, as the recent UNESCO report on Jewish sites in Judea and Samaria exposed, the Palestinian rejectionist narrative is foisted on the international agenda and is supported by an automatic majority in multilateral forums. The recent “study” prepared by Al- Mutawakel Taha, a senior official in the PA’s Ministry of Information, attempting to “refute” the Jewish claim to the Western Wall is merely the latest in a series of efforts, stretching back more than 100 years, to deny the Jewish people’s connection with its homeland. The myth that Jesus was a Palestinian is told to anyone who arrives on a pilgrimage to Bethlehem or other Christian holy sites under the Palestinian Authority. However, the facts once again don’t add up. The Jewish province of Judea was destroyed by Roman Emperor Hadrian in 135 C.E. when the Romans quashed the Bar Khochba-led Jewish revolt. To sever the Jewish connection with the Land of Israel, the Roman emperor changed its name to Syria Palaestina, eventually becoming known in English as Palestine. According to Christian scholars, Jesus was crucified somewhere between 26 and 36, a full hundred years before the term Palestine had even been coined. Correct in what it asserts but not entirely in what it denies. The province of Judea first got this name officially from the Roman empire, but it was used informally of the general region long before that. The word originally comes from the "Philistines," Indo-European invaders who settled on the coast in the late second millennium BCE. Herodotus used the term of the region between Phoenicia (Lebanon) and Egypt in the fifth century BCE (Hist. 3.91). I don't think there's much mileage in getting into an argument with the PA over this type of terminology. The point is that, yes, Jesus was a "Palestinian" inasmuch as two thousand years ago he lived in a place one of whose names is now "Palestine," but the earliest texts we have identify him as genetically and culturally "Judean" or Jewish. (For these purposes the distinction between "Galilean" and "Judean" does not seem to have been particularly important.) I have discussed the issue at greater length here. For Galileans vs. Judeans, see my discussion in my book, The Provenance of the Pseudepigrapha, pp. 56-59. Now, if there was nothing sacred for Muhammad to see there, why exactly did he travel to Jerusalem? Why couldn't he ascend to heaven, and talk to the prophets and to God straight out of Mecca? And if there was anything sacred for him in Jerusalem, what was it? The Palestinian Authority does not enlighten us. Perhaps it simply cannot, for now it caught itself in a dilemma: deny Jerusalem a Jewish connection -- and you make Muhammad's "night journey" look stupid, and render Jerusalem's status of Islam's "third holiest site" meaningless. But acknowledge Jerusalem's meaning to Muhammad, and you automatically affirm Jewish claims to the City of David. The PA's comments render the first (earthly) leg of Muhammad's Night Journey not "stupid" so much as pointless. Why go to Jerusalem if there's nothing special there? Background to this discussion is here. On UNESCO and "Rachel's Tomb," see here.